The stars have always been of great mystery to us, even before we began to understand what they were. The Andromeda Constellation myth is from an ancient Greek tale, in which King Cepheus was forced to sacrifice his daughter, Andromeda, to appease Poseidon. Andromeda was then chained to a rock, and left for the viscous monster, Cetus. Perseus, the hero of the tale, rescues Andromeda, and they both begin a wonderful life together. Goddess Athena commemorated Princess Andromeda’s struggle by giving her a place in the stars. And in 2nd century, the Greco-Roman astronomer Ptolemy looked upon the stars, and formulated the constellation, Andromeda, giving the myth a place in our skies. Andromeda is one of 48 constellations Ptolemy created in his work, Almagest. Before we get into Andromeda Constellation myths, we have to take a look at Andromeda Constellation facts – because this constellation is home to some of the most stellar (pun intended) star systems and deep space cosmological giants one can observe in the night skies. Undoubtedly, the most interesting object in this constellation is Messier31 – our beloved neighbour, the Andromeda Galaxy. Upwards of 220,000 light years across, with over a trillion stars, this galaxy is visible through the naked eye in spite of being a staggering 2.5 million light years from Earth. Milky Way, a mere 100,000 light years across is sort of like a little brother to Andromeda. In 3.7 billion years, the two galaxies will collide, creating a giant spiral galaxy called Milkdromeda. Maybe we’ll come up with a more original name by then. The other bright points of light outlining the Andromeda constellation are star systems, each more intriguing and complex than the next. Well, how many stars are in the constellation Andromeda? The Andromeda Constellation stars are some of the brightest systems we know of. 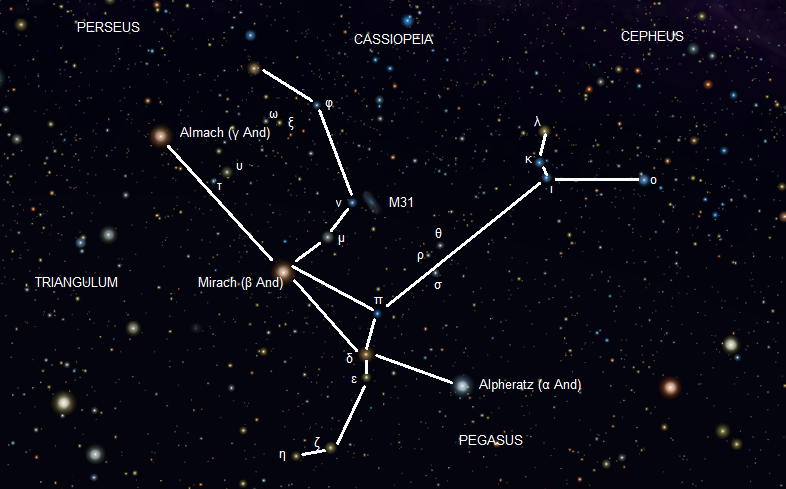 Alpheratz, also known as Alpha Andromedae – the brightest star system of the constellation, is the one that joins Andromeda to the great constellation of Pegasus. While previously thought to be one giant star, it is actually a binary star system, the primary member being a blue star (that means it’s hot, hot, hot!) with a radius thrice that of our sun. Its temperatures run at around 13000 Kelvin. This gigantic cosmic body has an unusual chemical composition – it’s a mercury-manganese star – in fact, it is the brightest mercury-manganese star we know of. A whopping 100 times larger than our sun and 4 times more massive, Mirach, commonly known as Beta Andromedae is a red giant that serves as a guiding star to three galaxies – the Andromeda Galaxy, the Triangulum Galaxy, and NGC 404. Occasionally, it is the brightest star in the constellation but it’s brightness varies at times. Gamma Andromeda, or Almach is one of the most interesting one of the lot – this star system has deceptively been hiding in it’s own brightness. At first we thought it was a binary system and then we realised it was a triple star system. Now, finally, the full picture is out – Almach is a quadruple star system. The primary star in the system is an orange giant 80 times the size of our sun. Amongst other members of the Chained Lady in the Sky are Le Gentil (Messier 32), a dwarf elliptical galaxy that shines brightly, making it visible through a telescope. It contains old stars with very little formation of new ones, which is quite interesting. Keeping Le Gentil company are Messier 110, a dwarf elliptical galaxy showing evidence of new stars being formed and The Blue Snowball Nebula or Caldwell 22, a planetary nebula surrounded by an enchanting blue disc. If you live in the Northern Hemisphere: From August through September, Andromeda shines bright low on the northeastern horizon every night at 10PM. Over the course of 6-7 hours, it climbs higher and higher in the sky, and will be right over your head around daybreak. Between October and November, the constellation decorates the eastern sky at around 8PM, crawling right overhead by the time midnight comes. As the dawn inches closer, it goes over toward the north-western horizon. In the cold months of December and January, Andromeda appears right overhead, at 6PM, gradually moving along the gilded sky toward the north western horizon. In February as spring approaches, Andromeda appears in the western sky after 7PM, gradually disappearing below the north-western horizon as midnight comes. If you live in the Southern Hemisphere: Andromeda shines bright in the Southern Hemisphere. It is clearly visible in the northern night sky. Between October and November, the constellation shines bright and visible around 10PM, low near the north-eastern horizon, slowly shifting toward the north-western horizon, remaining low and visible in the sky. In December, Andromeda shines low, close to the northern horizon at starting 10PM before disappearing below the northwestern horizons by 1AM. Queen Cassiopeia of Ethiopia boasted of her daughter Andromeda, saying she was more beautiful than the Nereids themselves. Now, the Nereids were sea nymphs of incredible beauty, and they did not appreciate Cassiopeia’s bragging. Offended at her remarks, they petitioned Poseidon to punish Cassiopeia for her insolence. Poseidon commanded the sea monster Cetus to attack Ethiopia. Andromeda’s father, horrified at the loss of his kingdom demanded to know how to appease Poseidon and make the destruction stop. At the instruction of the Oracle, Andromeda’s father leaves her chained to a rock for Cetus to take for himself, serving her as a sacrifice. Andromeda is saved, however – by the hero Perseus, who turned Cetus into stone with Medusa’s head. Andromeda and Perseus then married and had many children, living happily ever after. After Andromeda’s death, Athena gave her a place in the skies, in her honour. This tale may be pure fiction, but even then, when the Universe around us was pretty much beyond our understanding, our stories revolved around the stars, giving meaning to them in our own way. Now, we live in an age of telescopes and deep sky observatories and we get to do something no generation ever got to do before – observe the stars as they truly are, engaged in their infinite cosmic dance.